Many retailers use product ratings as a way to convince buyers that they should take the next step in conversion, which is usually a cart addition. Showing how often a product has been reviewed and its average product rating helps build product credibility and something consumers have grown used to from popular sites like amazon.com. Digital analytics tools like Adobe Analytics can be used to determine whether the product ratings on your site/app are having a positive or negative impact on conversion. In this post, I will share some ways you can track product review information to see its impact on your data. Lastly, if you have products that don’t have ratings/reviews at all, the preceding reports will have a “None” row, which will allow you to see the conversion rate when no ratings/reviews exist, which may be useful information to see overall impact of ratings/reviews for your site. 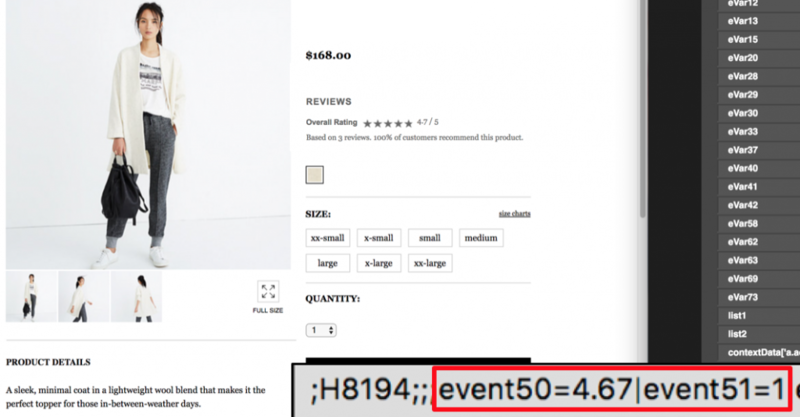 Using both eVars and success events to capture product ratings/reviews on your site allows you to capture what your visitors saw for each product while on your product detail pages. Having this information can be helpful to see if ratings/reviews are important to your site and to be aware of the impact for each product and/or product category. I love this, particularly the part about trending the product review rating value over time. Thanks, as always, for a great idea!